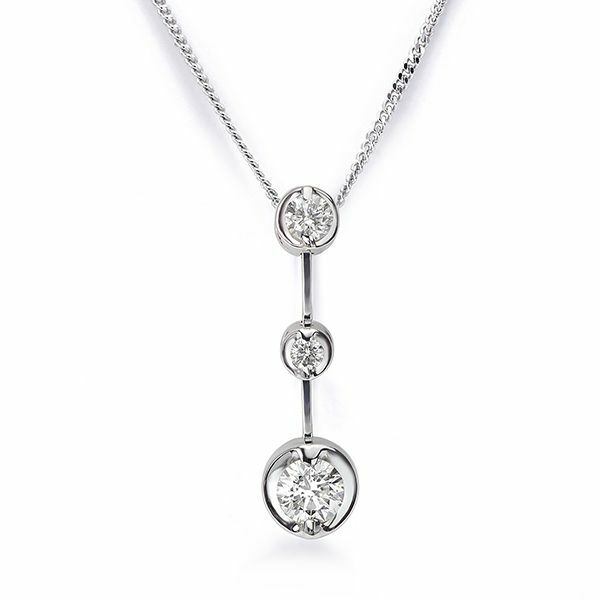 The delightful Cascade Diamond drop pendant offers a simple and elegant trilogy pendant design—perfect for any occasion. Set with approximately 0.30cts of Round Brilliant cut Diamonds, the design sparkles with three linked sections adding movement and sparkled from each Brilliant cut Diamond. Each Diamond is fully faceted and achieves a Diamond grading of G Colour whiteness with SI1 Clarity for incredible sparkle. This stylish pendant design is crafted in luxurious 18ct White Gold and presented within beautiful packaging with a matching 18-inch curb chain ready to wear. This pendant design is typically available from stock subject to availability and can be delivered by secure courier to your door to many locations Worldwide.